Google announced a new study they are behind with Ipsos MediaCT where they show how search ads not just improve conversions but also improve brand awareness, or as they call it "top-of-mind" awareness. In each of the studies, 800 qualified consumers ran simulated searches for certain category keywords, like “hiking boots” or “small cars” on their desktop or laptop. They were then shown either a Control search engine results page (SERP) or a Test SERP created for the study, which put the test brand in the top search ad position. Consumers were then asked to name which brand first came to mind for the category keyword. An average of 14.8% in the Test group named the test brand, while just 8.2% of the Control group named the same brand. 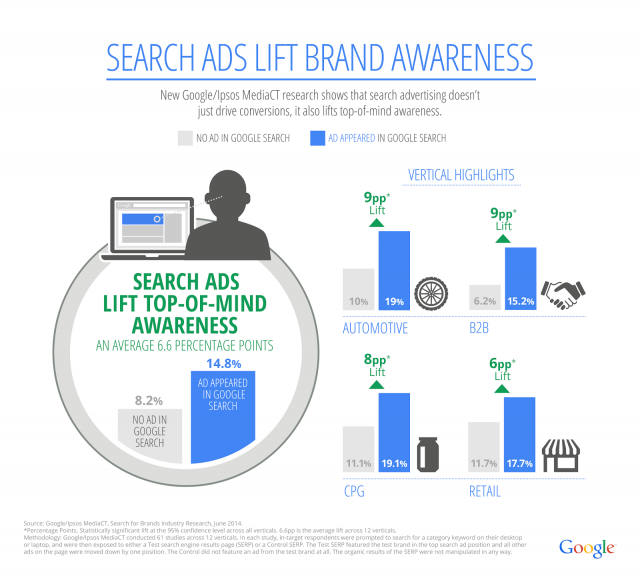 That’s a 6.6 percentage point increase or an average 80% lift in top-of-mind awareness. Now, the phrase top-of-mind, I believe was coined by Dana Todd back in 2004 as the slogan for SEMPO. So the phrase is ten years old now. For more details on this study, see this page.